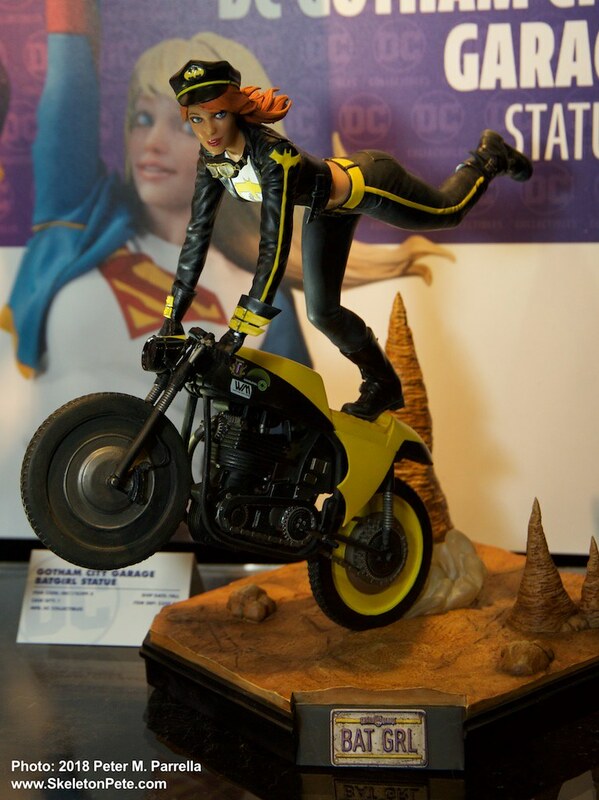 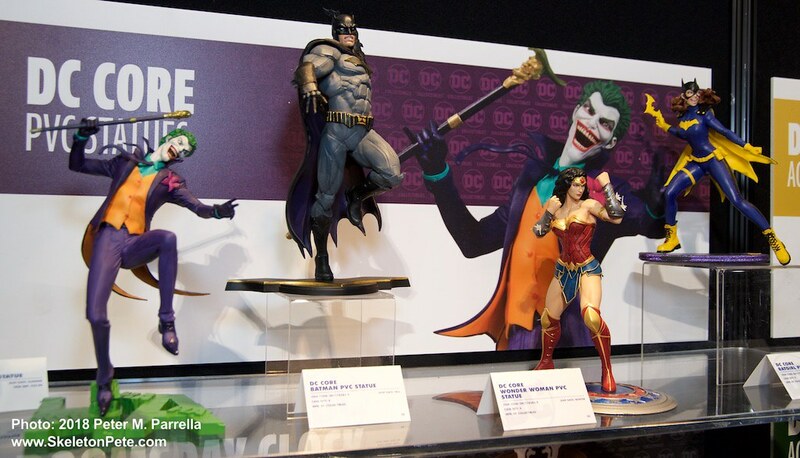 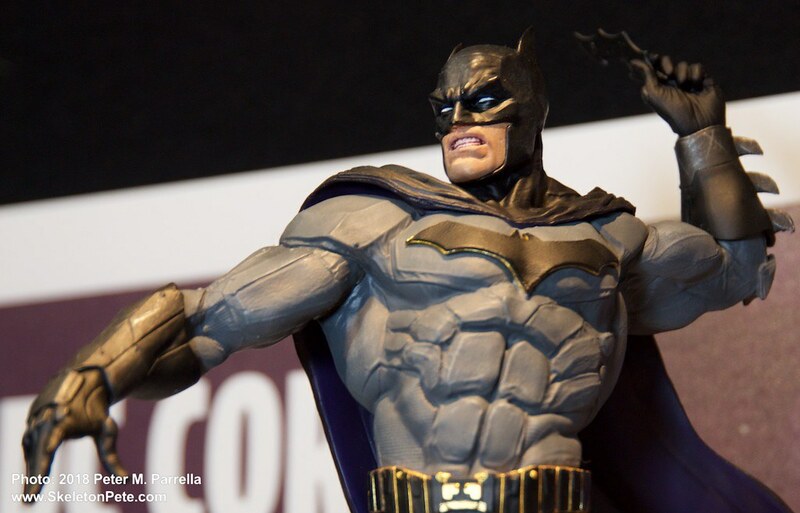 One of the most enjoyable parts of attending the Toy Association’s Annual New York Toy Fair is the opportunity to visit with the fine folks at DC Collectibles and get a look at the amazing array of want-to-owns they have brewing. 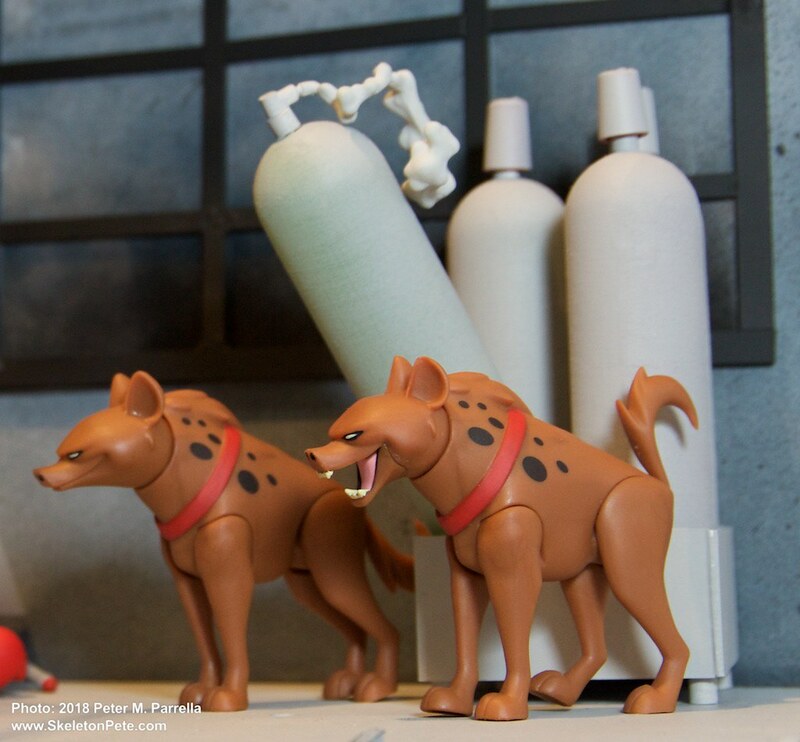 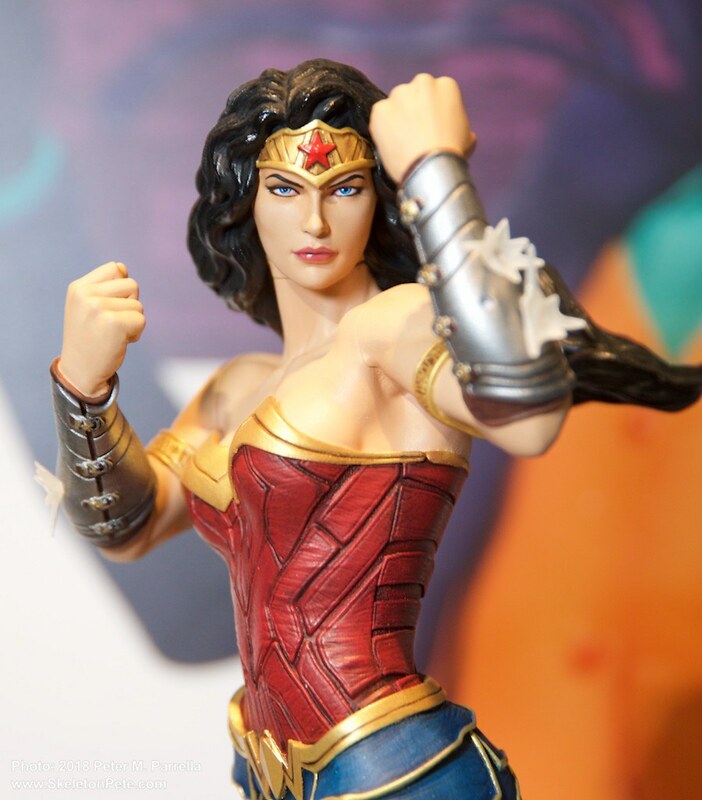 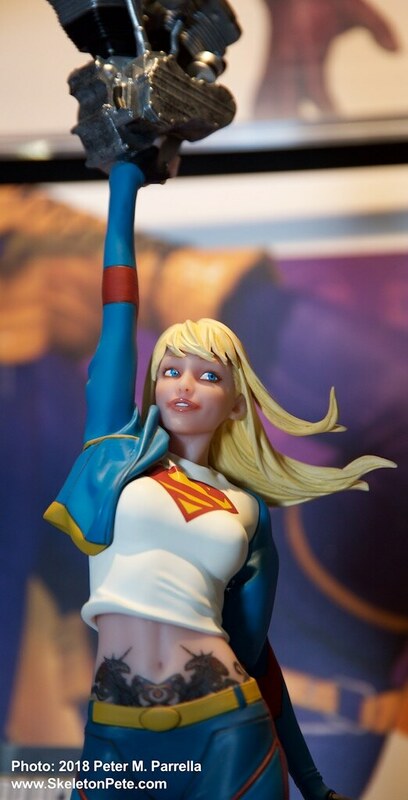 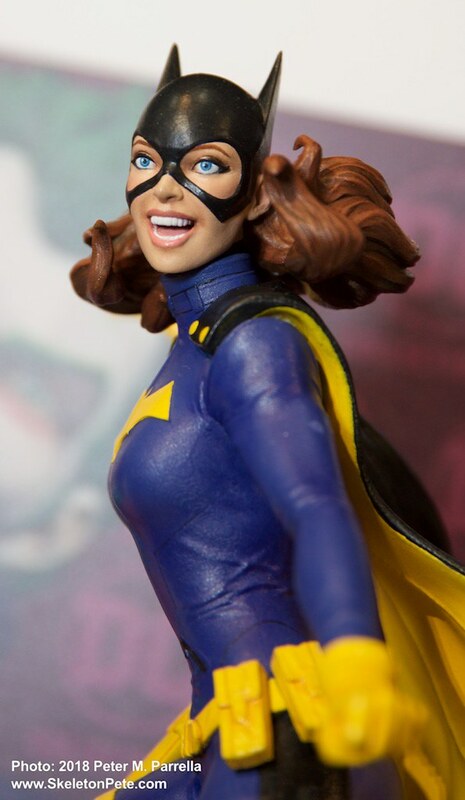 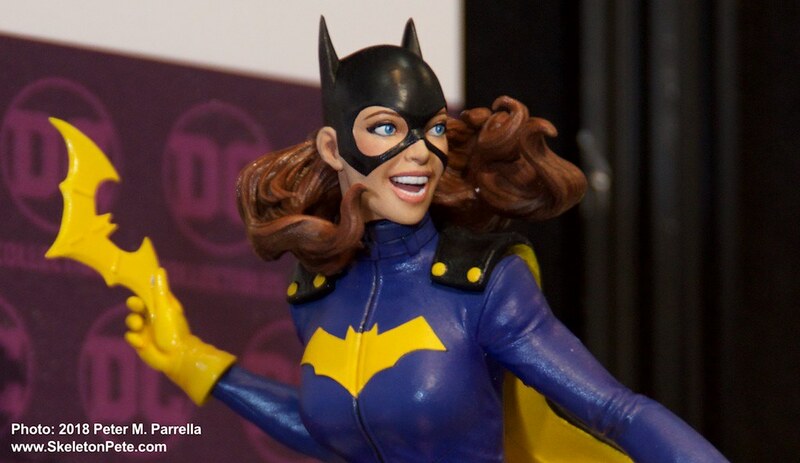 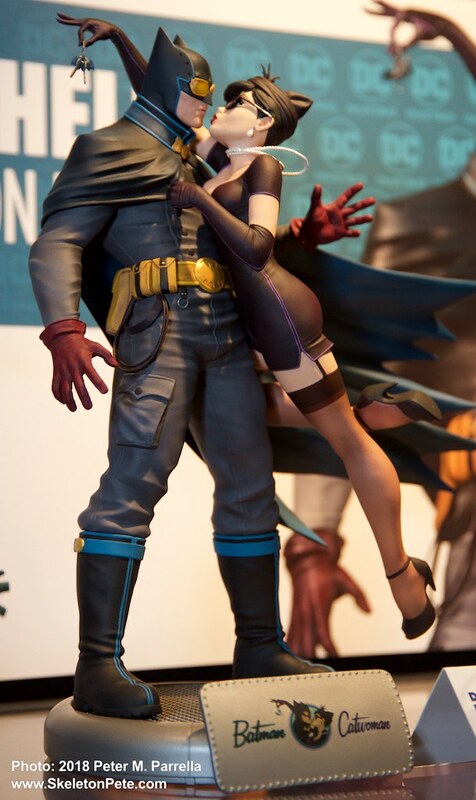 The company has continued to surprise us with products ranging from highly play worthy articulated action figures to detailed, and often unexpected, resin and PVC statues like the popular Bombshells line. 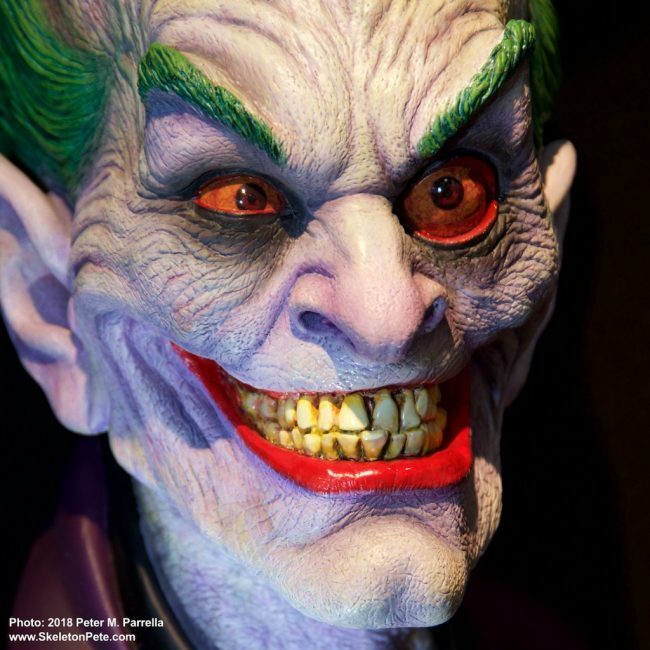 It’s quite appropriate that the Academy Award winning artist would capture the Joker with just a hint of his silver screen inspiration in the frozen grimace of Gwynplaine portrayed by Conrad Veidt in Universal Pictures’ 1928 film The Man Who Laughs. 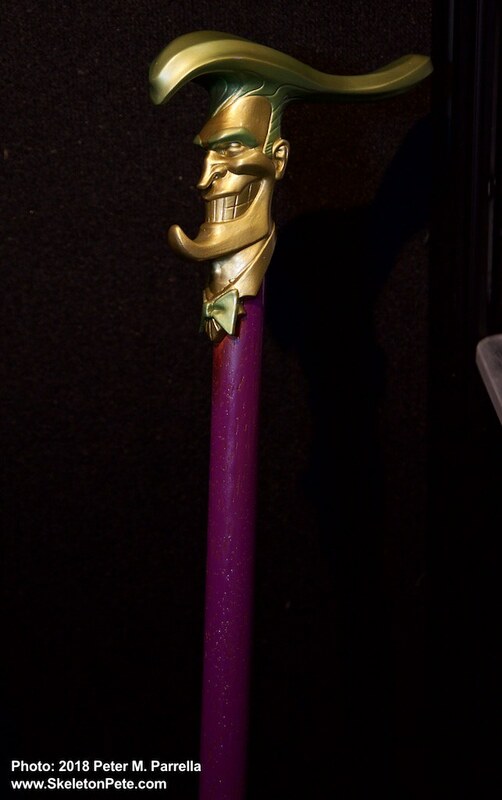 Veidt missed further immortality by a bat’s fang when he was passed over for the role of the vampiric count in Universal’s adaptation of Bram Stoker’s Dracula (1931). 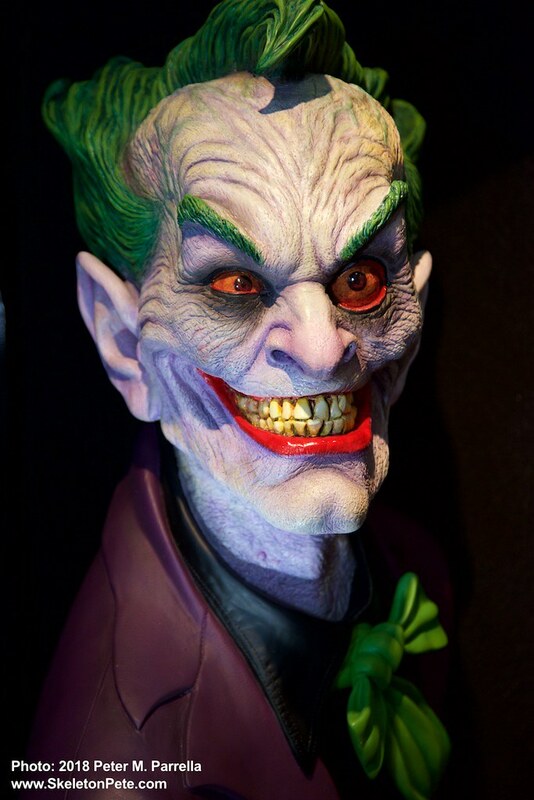 Only 200 Joker busts, cast from Baker’s original molds, will be offered with an expected release date of October 2018. 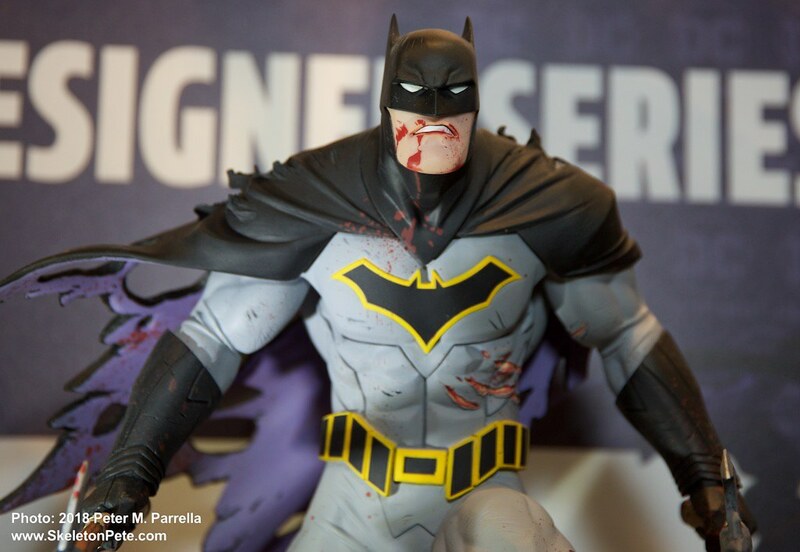 Of that number 50 will be exclusive variants embellished in Baker’s original color scheme with black shirt. 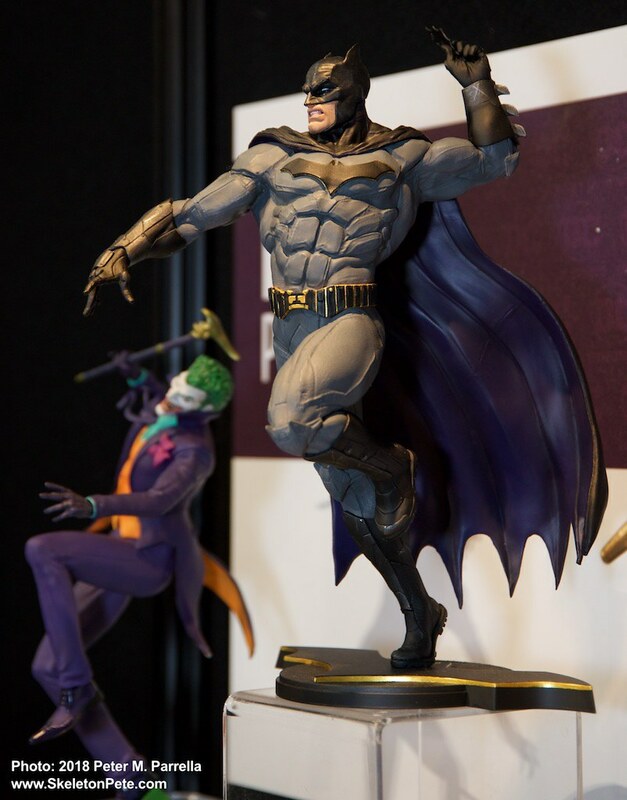 They will be numbered 1-50 and include a certificate of authentication signed by the artist. 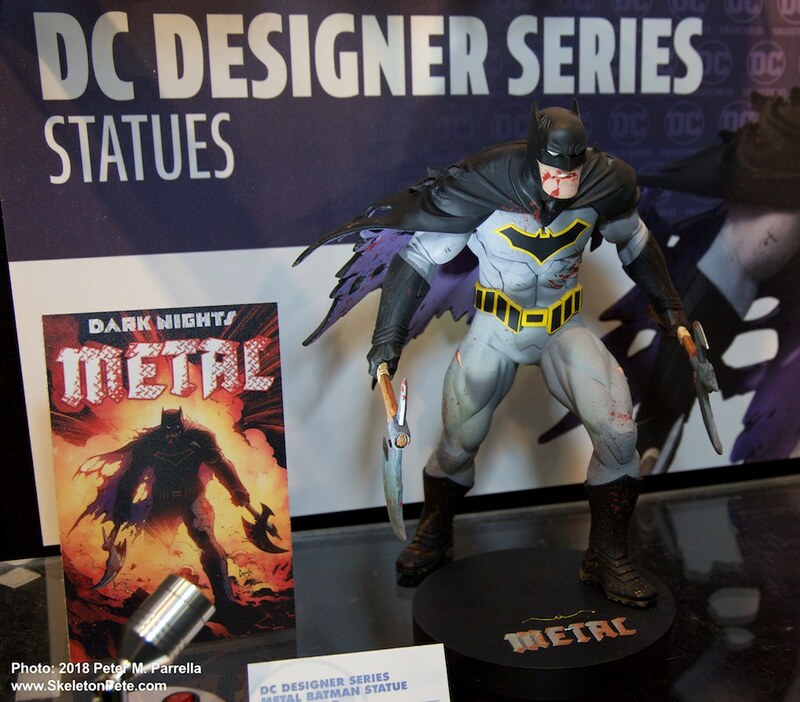 The standard (orange shirt) version will be numbered 1-150 and have an MSRP of $1000.00. 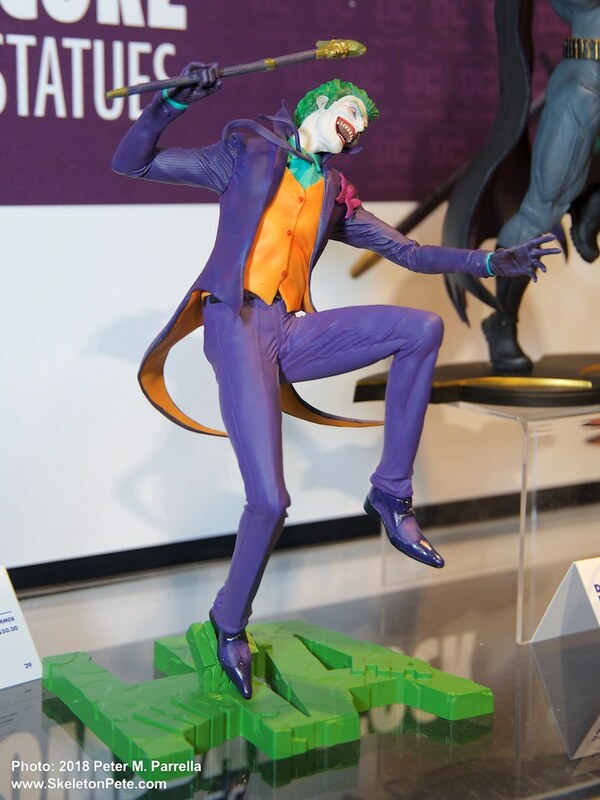 The variant will be priced at 1500.00. Just a kiss away… Catwoman cops the keys to the Batmobile. 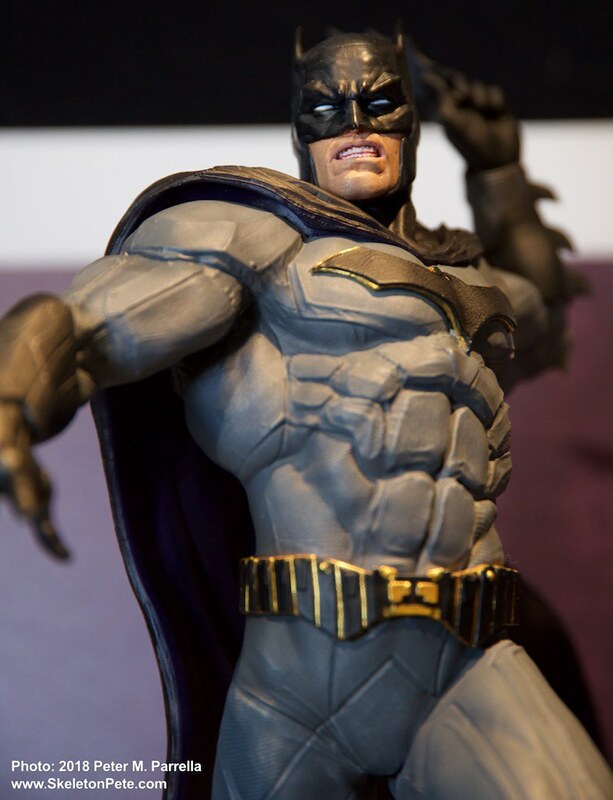 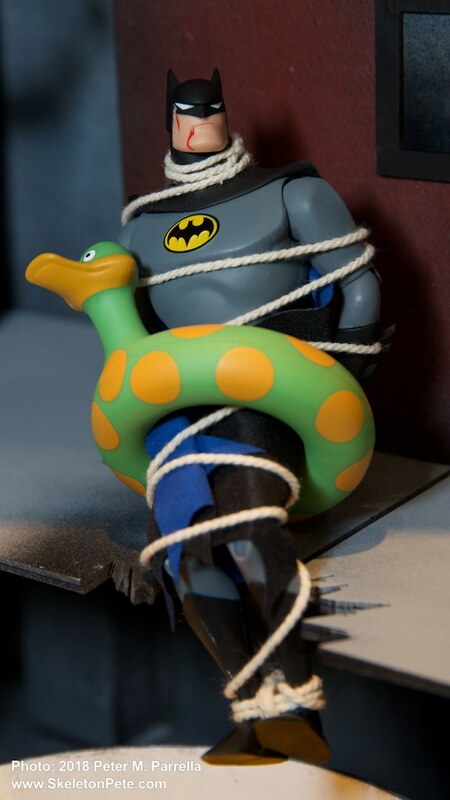 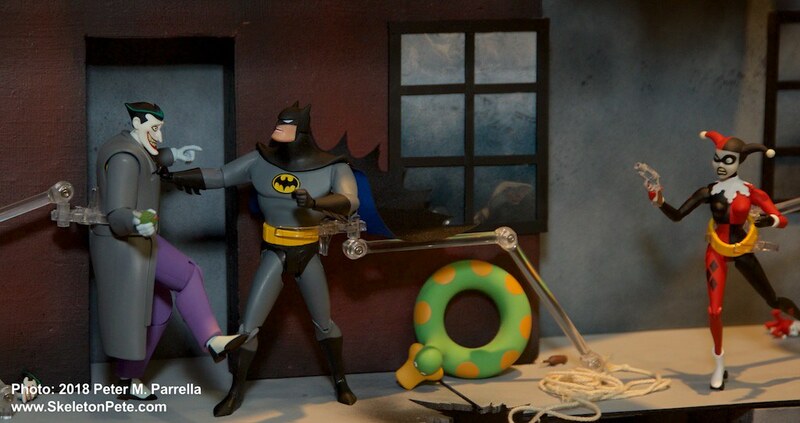 There are plenty of other Batman related items in all price ranges coming your way. 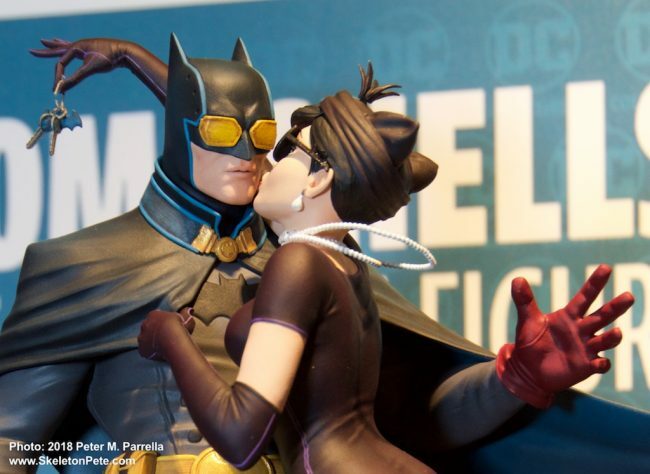 The aforementioned Bombshells line adds a crafty Catwoman disarming the Dark Knight with a smooch as she steals the keys to the Batmobile. 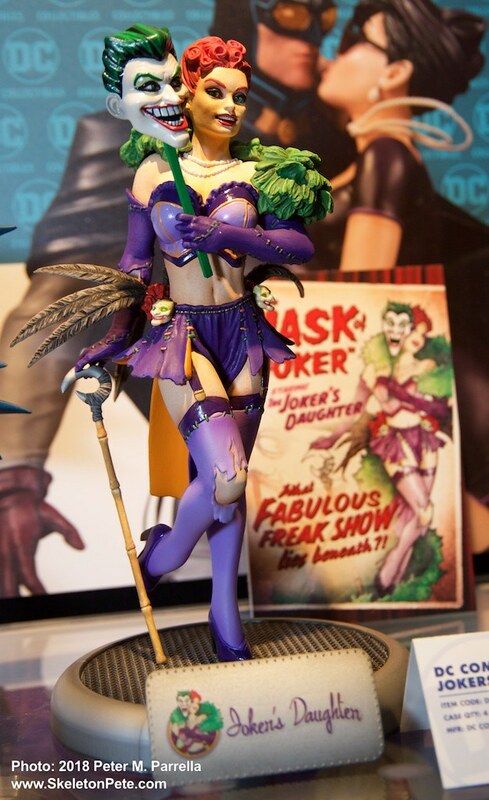 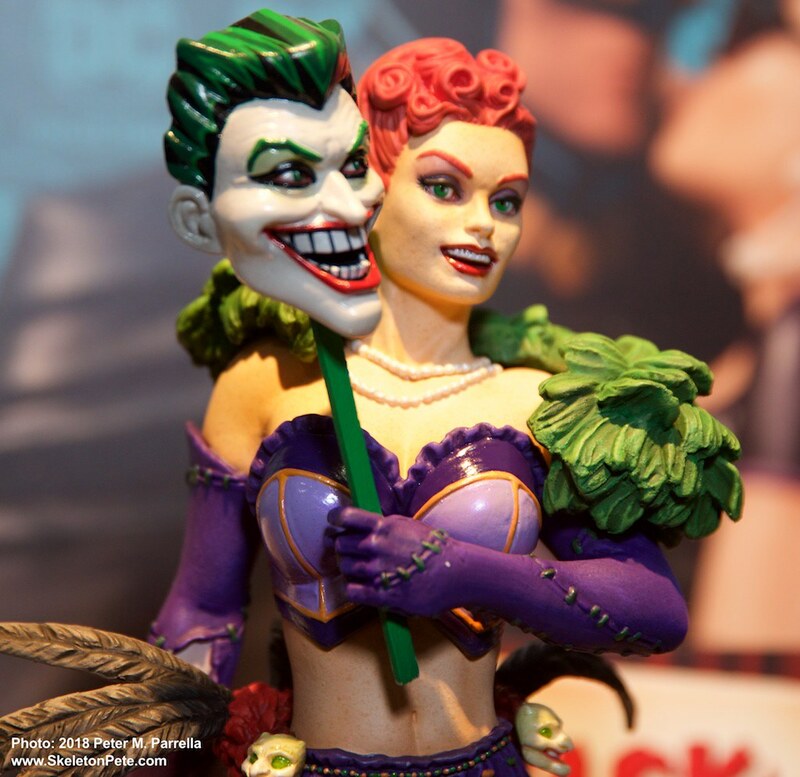 A beautifully detailed Joker’s Daughter in carny mode joins the product line as well. 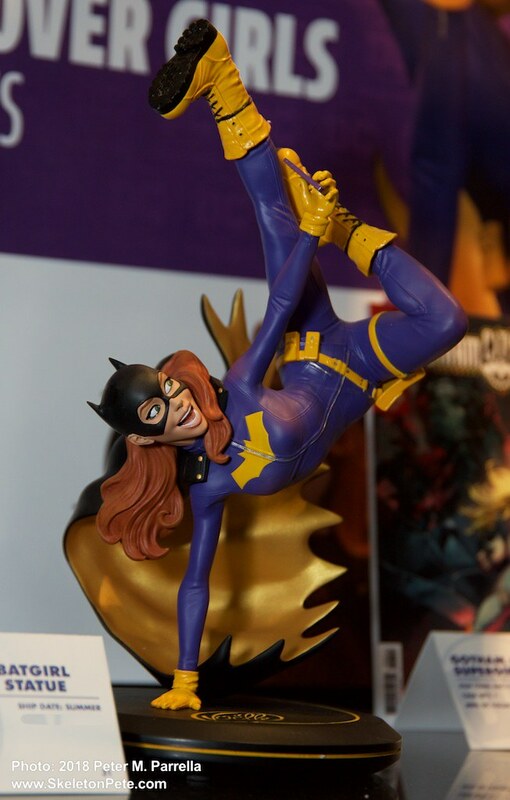 Jöelle Jones’ selfie taking Batgirl. 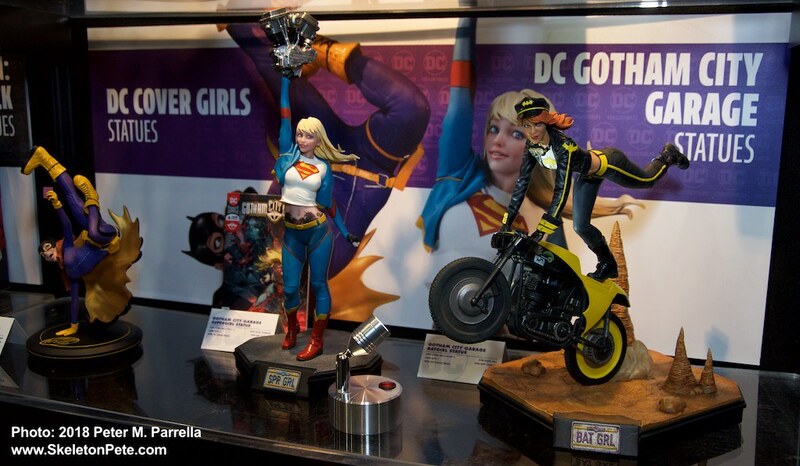 Bombshells’ sister series Gotham City Garage (see Andy’s coverage) adds a motor hoisting Supergirl and wheelie popping Batwoman. 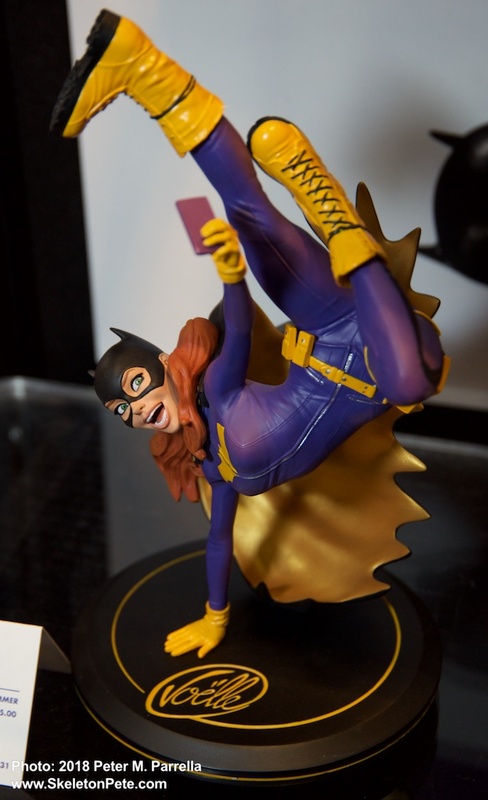 My current fave is the Jöelle Jones designed DC Cover Girl Batgirl, snapping a selfie while displaying her acrobatic acumen. 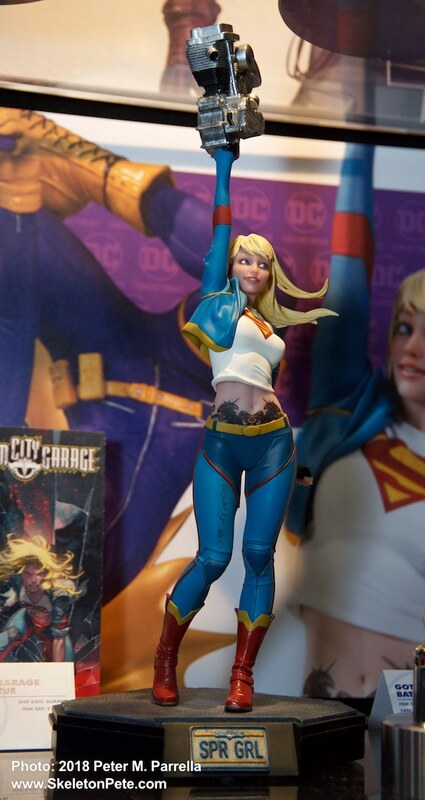 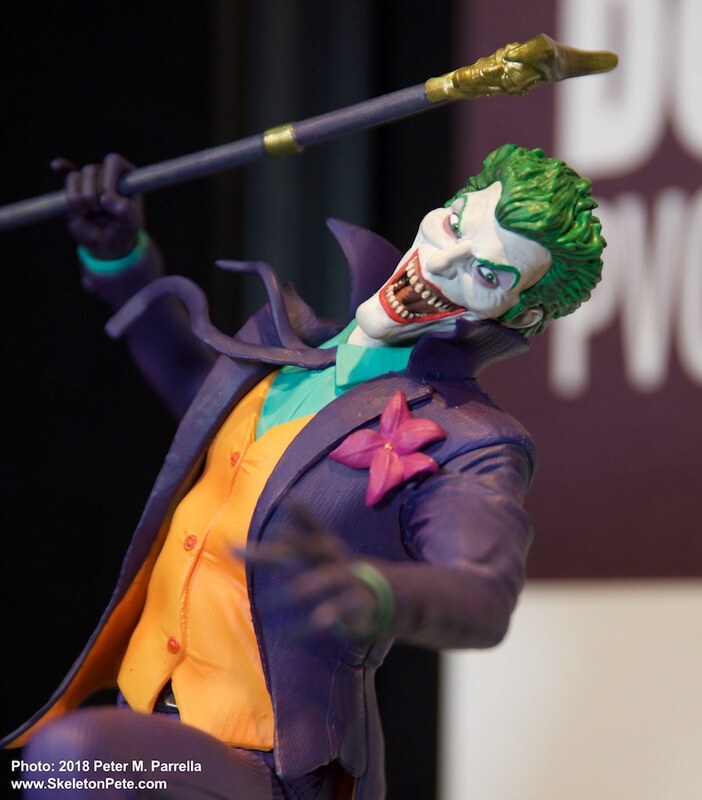 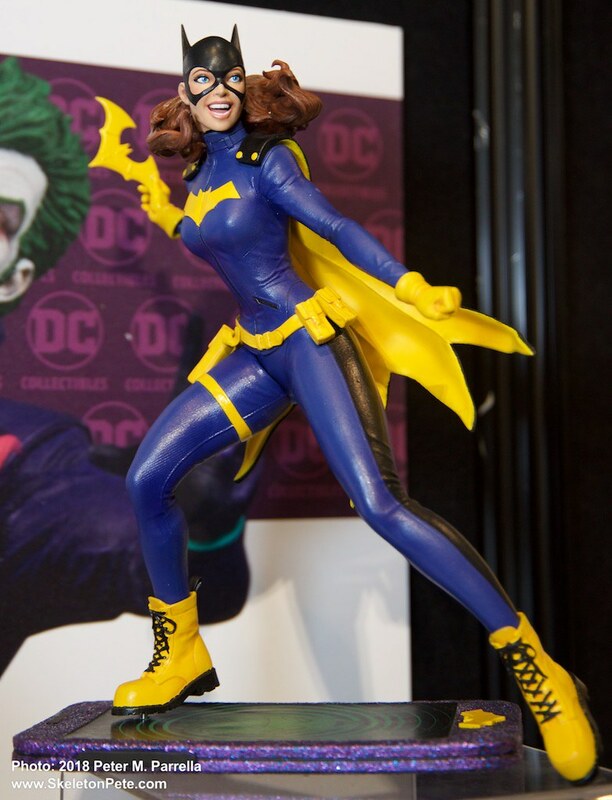 The angular quirkiness of DC Collectibles’ Artists Alley Series offered many other eye catching objects of desire and we’ll be offering up a look at those next week. 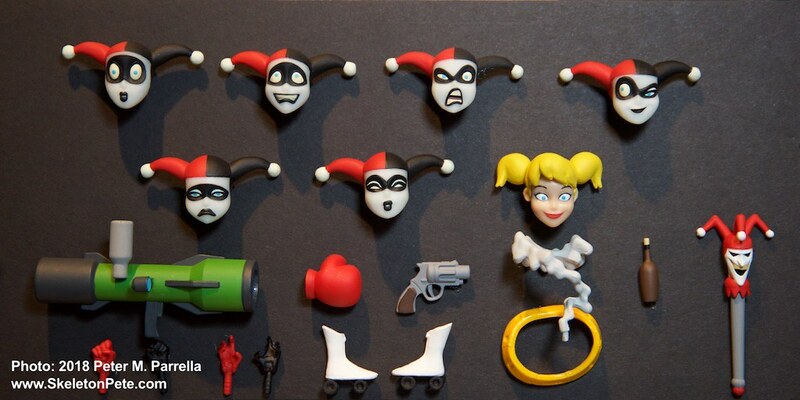 Batman, The Animated Series fans will love the many moods of Harley Quinn.